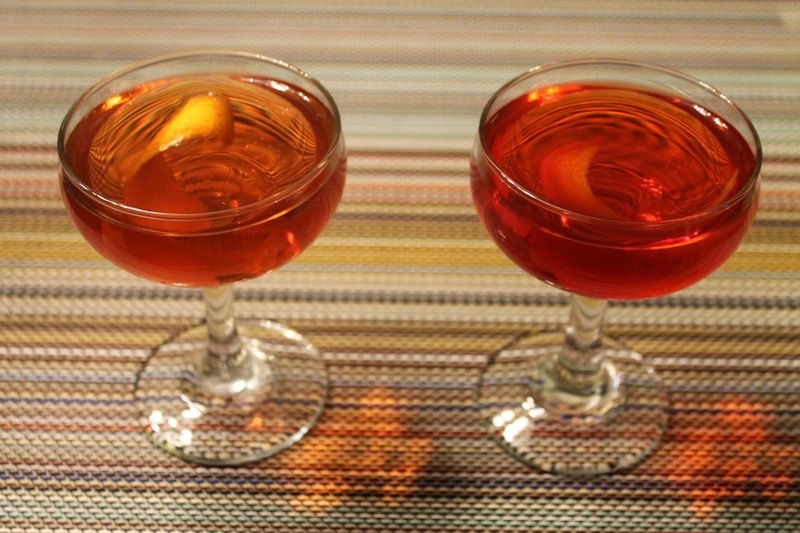 I've really gotten into Manhattans lately, and the classic cocktail is an ideal drink for winter, made with the ruddy warmth of rye whiskey and modified by the bitter-sweet flavors of sweet vermouth and bitters. At least that's how it works traditionally, as in the Manhattan I made during my cocktail bitters week last summer. The nice thing about a Manhattan is that its simple formula presents a lot of room for experimentation. In the Death & Co book I discussed yesterday, for example, there are 13 variations on the Manhattan, including drinks made with rum, pisco and even tequila. Browsing through the PDT Cocktail Book looking for a good drink, I happened upon the two Manhattan variations on page 105: the Deshler, made with orange liqueur, and the Dewey D., made with sherry and Aperol. I couldn't decide which sounded better, so I made both. And liked both. The Dewey D. is the stronger of the two, since it has more whiskey and the sweetness of the cointreau mellows the Deshler more. But I love the use of Aperol, my favorite Italian aperitif, in a Manhattan. Combine whiskey, sweet vermouth, Cointreau and bitters in a cocktail mixing glass with ice. Stir until well-chilled. Strain into a chilled coupe and garnish with orange twist. Combine whiskey, sherry, Aperol and bitters in a cocktail mixing glass with ice. Stir until well-chilled. Strain into a chilled coupe and garnish with orange twist.